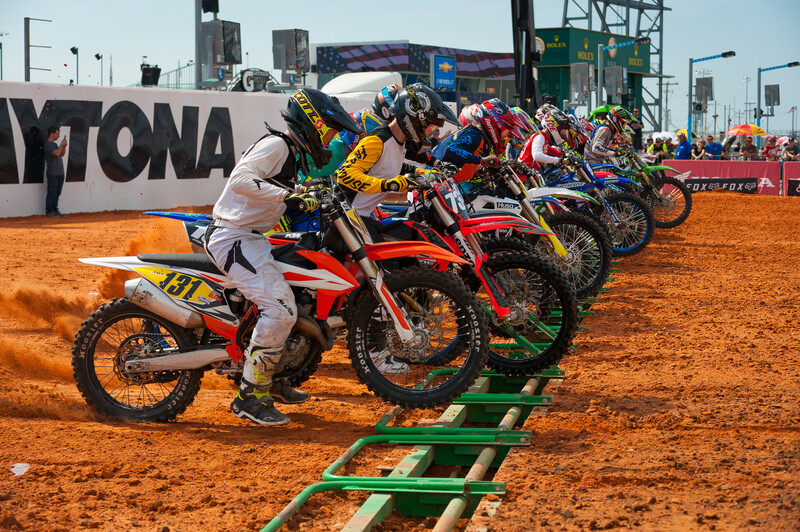 DAYTONA BEACH, Fla. - The 10th Annual Ricky Carmichael Daytona Supercross (RCSX) wrapped up two full days of racing on Monday, March 11th, at the historic Daytona International Speedway in Daytona Beach, Florida. Using a supercross format, 1159 entries from all over the world, including some of the biggest names in amateur motocross, battled for national championships and AMA number 1 plates in 34 classes, from youth riders on 50cc bikes all the way to Golden Masters (60+). 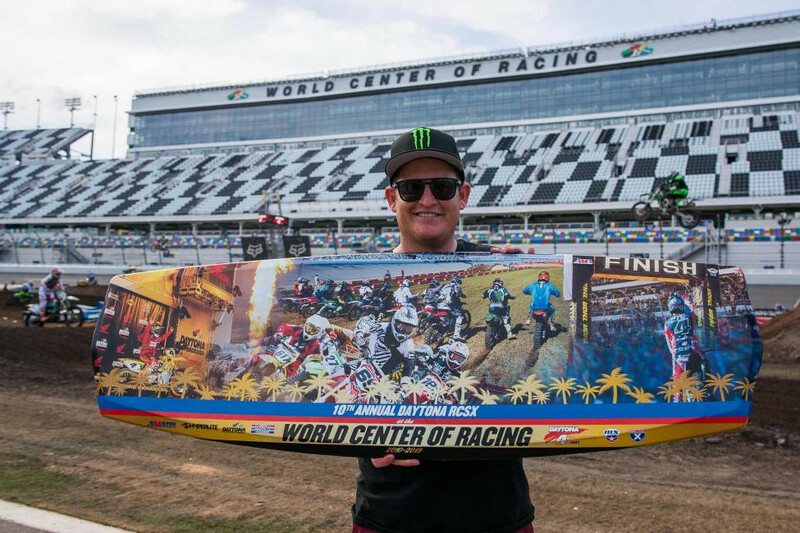 Thanks to Ricky Carmichael's leadership, combined with the spectacular Daytona International Speedway facility, the Annual Ricky Carmichael Daytona Supercross has become one of the premier amateur events in the world. Two riders who had standout performances at this year's event were Seth Hammaker and Jarrett Frye. Frye crushed the Schoolboy 2 class plus the 250 B and 450 B classes, while Hammaker won titles in the 250 A and the Open Pro divisions, and, in fact, won every race he started. The two were among the 23 riders who won a total of 34 main event races at the event. Jarrett Frye overcame a late-race bobble to win the Schoolboy 2 final. Frye, who recently joined the Star Racing/Yamaha team, won his heat race ahead of Matt LeBlanc to qualify into the final. 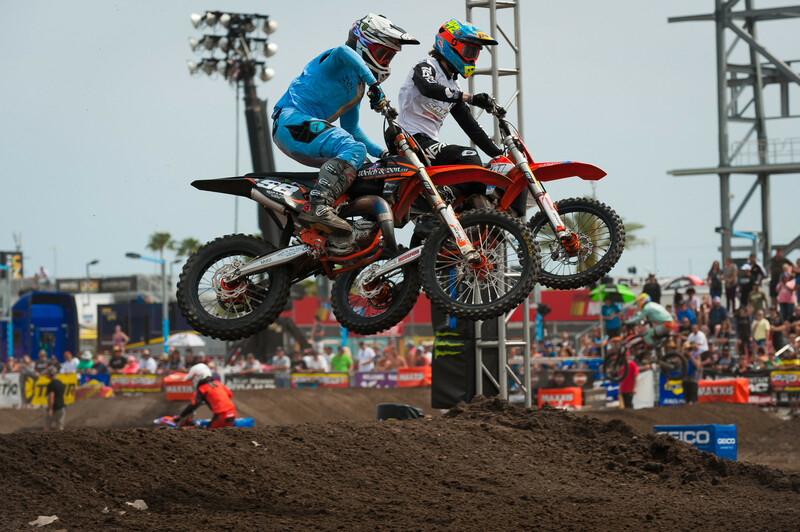 In the final, Frye grabbed the holeshot and immediately started gapping the field, with his teammate LeBlanc in tow. Jack Rogers (Yam), Jonah Geistler (KTM), Gage Linville (KTM), and Nate Thrasher (KTM) filled out the top five during the early minutes of the race. Frye continued to stretch his lead, eventually finishing over eight seconds ahead of LeBlanc at the finish, while Geistler moved around Rogers to claim third. "I pulled the holeshot and just tried to find good lines and build my lead," Frye said after the race. Frye also won the 450 B class, with Husqvarna-mounted Colin Park in second and Kawasaki's Bjorn Viney in third. After taking the lead, Frye rode a very uneventful race to take the win. "I got off to a good start and I was third after the first turn," said Frye. "I made two passes in the second turn to take the lead and I just rode smart the rest of the way." In the 250 B Limited class Jace Kessler took the win, although it was no easy task since he DNFed his heat race, which meant he got one of the last picks at the starting gate in the final. The BTO/FMF/Dunlop/Husqvarna/O'Neal/Alpinestar/Thrill Seekers-back Kessler took a foot peg to his front wheel, which blew out his spokes and forced him to drop out of the heat race. In the final, Kessler moved up quickly from a mid-pack start and was right behind the leaders by the end of the first lap. Halfway into the race, Kessler took the lead with a pass on Yamaha-mounted rider, Blake Hoag, through the mogul section right after the big wall and the rhythm section that preceded it. He was particularly fast in that section and that was where he gained the most time on the competition. "I just held it on through the moguls and made a block-pass for the lead," said Kessler. "Since I DNFed my heat race, I was way outside on the start gate, so I tried to find a gate that had a lot of moisture. I didn't get the best of starts so I just made some quick passes and once in the lead, I just tried to ride my own race and build up a lead." At the finish, Kessler took the win with over Yamaha-mounted Gerhard Matamoros of Honduras, with Wyatt Lieback (KTM) in third, Seth Brown (KTM) in fourth and Yamaha-mounted Evan Haimowitz rounding out the top five. Seth Hammaker stalled his bike with two laps to go in the final of the Open Pro Sport class, but he was still able to come away win an impressive win. Carter Halpain (Yam) and Tristan Lane (KTM) were second and third. "The track is pretty demanding so you have to ride smart, but I made a few mistakes, which is on me," said Hammaker. "I was happy to get the win. I made a lot of mistakes, and I'm a little bummed on that, but I'll go back and regroup and fix those. I got a great holeshot and just tried to sprint away and just maintain my pace." Tyler Mollet (Yam) led early in the 65 (7-11) final with William Mercure (KTM) in second. Kade Johnson (KTM) sat in fifth, however in one lap Johnson went from fifth to second behind Mollet. Two laps before the finish Johnson made a dramatic pass on Mollet on the outside of a turn, however just one turn later Mollet passed Johnson to retake the lead. Mollet would lead another lap before Johnson would put a move on him to retake the lead. A few turns later Mollet went down in a turn, although he was able to hold onto second. At the finish Johnson took the win, with Mollet second and Mercure in third. "I got off to a not so good start; everyone jumped and I just sat there for a second until I realized we were racing," said Johnson. "I was about 10th after the start, but I made few quick passes and I was about fifth on the second lap. The next lap I passed Mollet and was able to get the win." One of the best battles of the event was in the Supermini 1 final. Nick Romano, who finished fifth in his heat race, grabbed the holeshot to start the opening lap. The Bayside, New York rider pulled a five-bike length lead during the opening lap, however Jett Reynolds was hot in pursuit, closing in on the Husqvarna rider by the third lap of the race, with Gavin Towers and Crocket Myers not far behind. Reynolds soon pulled close enough to attempt a pass on Romano. Romano and Reynolds made contact as Reynolds made a move for the lead. Romano held him off, however Reynolds was able to make the pass for the lead in the next corner when he went outside to inside in a turn to pass the Husqvarna rider. In the meantime, Towers and Myers amped up their battle for third. Romano latched onto Reynolds, hoping to regain the lead, as Reynolds slowly pulled away. Halfway into the race, Myers pulled within striking distance of Romano, however Romano took a digger when he tagged a tuff-block, handing second to Myers. Romano DNFed the race, while Reynolds claimed a solid win ahead of Myers in second and Towers (KTM) in third. Caden Braswell (KTM) and Myles Gilmore (HQV) rounded out the top five. "I got really bad blisters on my hand in the Supermini race and it was really hard to hold on," said Reynolds. "I took my gloves off right after the finish and my gloves were full of blood." Team Green Kawasaki's Ryder DiFrancesco took the lead off the start in the Mini Sr 2 class, after Mark Fineis (KTM) bobbled taking the outside line around a berm. Ultimately, DiFrancesco rode a solid and fast race to finish ahead of Gilmore (HQV) for the win, with KTM riders Noah Smerdon, Ivan Aldama Jr, and Ivan Boespflug rounding the final top five. "I got off to a good start, and I had about a five-second lead for most of the race," said DiFrancesco. " Logan Leitzel avoided a first turn pileup to take the initial lead in the 15-lap 250 A final, however Carter Halpain took control of the race after a few turns. Devin Simonson also passed Leitzel to move into second on lap two, soon after that the Yamaha rider moved into the lead. At that point, Halpain moved back up to challenge Simonson for the lead as Simonson let it fly on the big wall jump. Midway into the race, Team Green Kawasaki's Seth Hammaker moved up quickly to put his Team Green Kawasaki into the lead after making an inside pass on Simonson. Hammaker was buried in the pack out of the first turn, but was passing riders as quickly as he caught up to them en route to catching and passing Simonson. Within a lap, Hammaker held a 2-second lead over Simonson with Halpain in third. Halpain moved back into second with three laps to go, however he crashed near the end of the race as Hammaker pulled away to a twenty-nine-second victory over Simonson, with Kobe Hefner (KTM), who inherited third when Halpain fell, in third. In other races, Cobra rider Darren Pine took the victory over Zacariah Carmichael (Cob) and Travis Johnsmeyer. Cobra riders Timothy Scott and Marcus Trujillo rounded out the top five. In the 250 B class, Jarrett Frye took the win over Matt LeBlanc and Cullin Park, with Jace Kessler and Logan Boye rounding out the top five. Ryder DiFrancesco (Kaw) won the highly competitive Mini Sr 1 class, topping KTM riders Mark Fineis and Ivan Aldama Jr for the honors. The Supermini 2 class was won by Gavin Towers (KTM), with Mark Fineis (KTM) and Evan Ferry (HQV) finishing second and third. Jett Reynolds (Kaw) and Sage Lewis (KTM) were fourth and fifth. Other winners included Ethan Lane in the 125 C class, Derek Leatherman (Suz) in 250 C Limited, Kai Jung Simons (Kaw) in 250 C Jr., Nate Thrasher (KTM) in the 125 class, Hannah Hodges in the Women's class, and John Grewe (Kaw) in the Masters (50+) class, just to name a few. 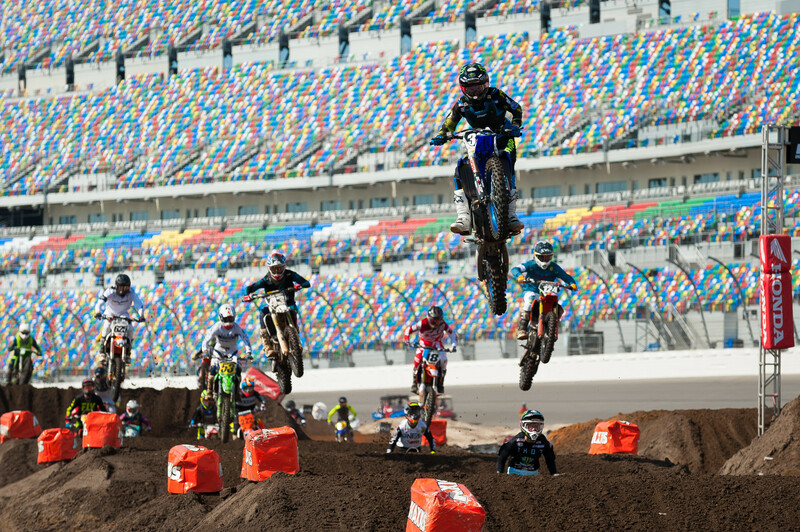 In all, 34 titles were awarded at this year's event, and most of the riders, including Jace Kessler, agreed that the course was the best Daytona amateur course of all time. "The layout was really cool," said Kessler. "It had some technicality to it, and there were a lot of options as far as lines. I loved it." 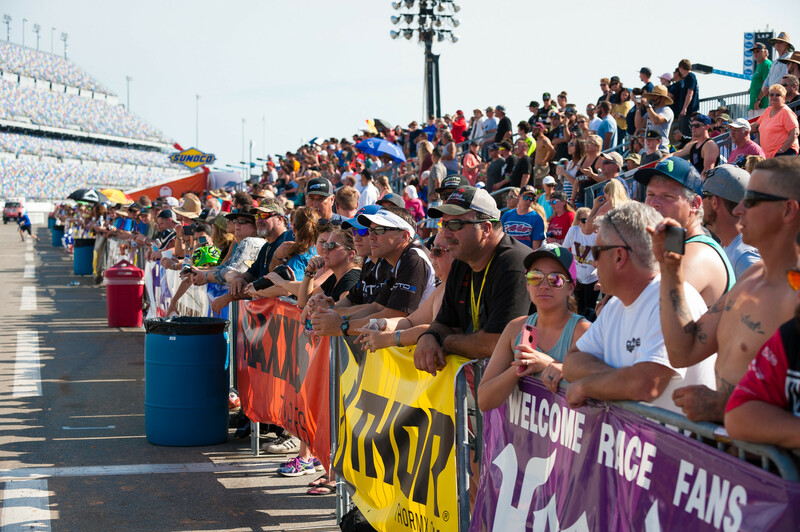 For more information on the Ricky Carmichael Daytona Supercross, visit the series official website at www.racedaytona.com or call (304) 284-0101. Join the conversation on the event's social media channels, along with receiving the most up-to-date news and exclusive content.